What makes a fashion ‘statement’? I always tell my style patients (my clients) that a statement piece is a hero piece and something that really stands out. It could be because of the colour, the print, the fabric, the design or something that is so unique it stands out. People often make a statement with their accessories too. It could be an amazing bag or an incredible pair of shoes which can often elevate the look. When I shop with my style patients quite often I show them something that is perfect for their shape and colouring and they say I would have never picked that out and when they try it on they absolutely love it. Sometimes they’re stuck in a rut and buy the same things, sometimes they are scared to try something new, sometimes that just don’t know what suits them which is why they sought style medical help and other times they don't have the confidence to wear a statement piece. Confidence comes from knowing what suits you and what you look good in and anyone can look good no matter what shape of colouring you have because your confidence will shien through. I wanted to show you all you don’t have to be scared to make a statement and I also want to show you that statement pieces can be versatile too. You can easily take a statement piece from day to night, to work too if you are brave. To prove it, I have chosen these fabulous pants which can be bought on Lordis. 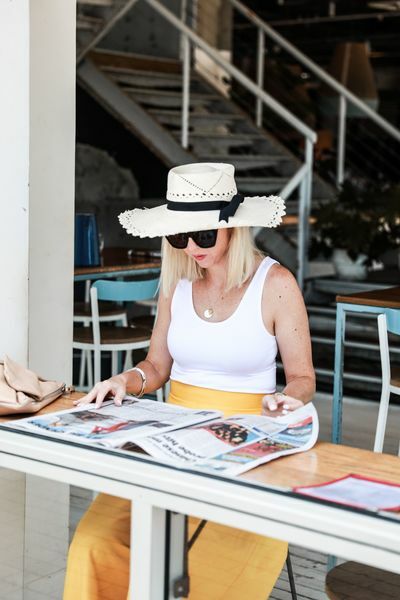 Lordis is a carefully curated online store full of bold and colourful pieces that have been selected by the talented sister-in-law duo Jenn and Gems who you may know from Palmaira Sandals Australia. These women were a finalist at the 2018 Telstra Business Women of the Year awards and one online business wasn’t enough for these ambitious women so they have opened Lordis. The pants I chose are by Paper London which is a label started by one of the Palmaira girl's friend back in London. Paper London was a recipient of the British Fashion Council Contemporary Award, two seasons in a row, and I have been eyeing off their pieces for some time now. 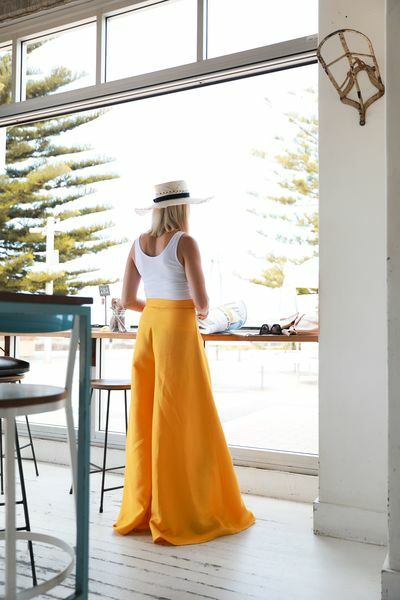 I fell in love with these high waisted palazzo pants and I have styled them 3 different ways but before I show you the looks I want to share some style tips. 1. When chosing colour, if it’s a top or dress you need to choose a colour in your colour palette because it’s close to your face and the wrong colour can wash you out or do nothing for you and the right colour can bring out your best features, flatter your skin tone and make you look absolutely amazing. 2. 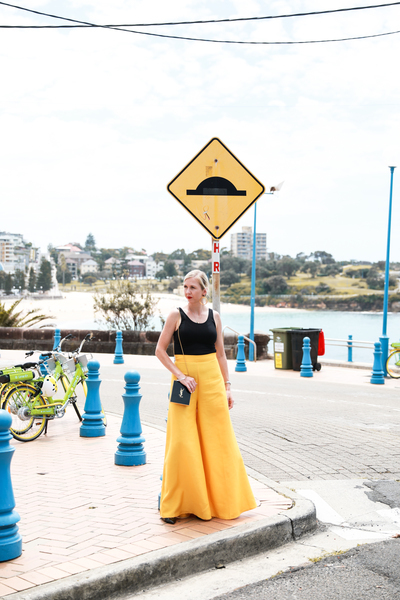 If you love a colour and it’s not in your colour palette then wear it down the bottom in a skirt or pants, as I have here. 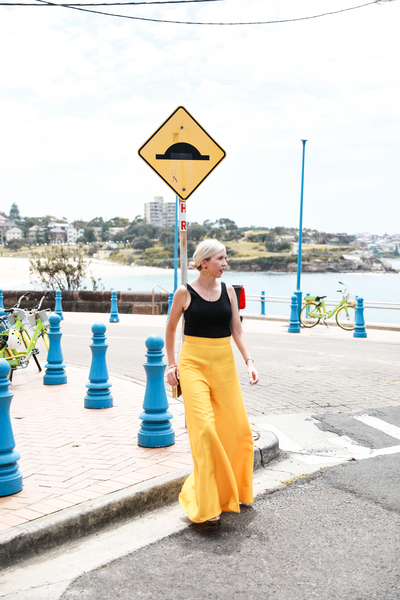 Yellow is such a bright and happy colour which I love but it’s not in my colour palette because I have fair and freckly skin and blonde hair. Yellow looks amazing on people with a tan or warm undertones in their skin. 3. When chosing a statement piece, make sure it suits your shape. There is nothing worse than making a statement and standing out if it’s not flattering on you. 4. If you have a statement piece and it's an expensive piece it will stand out on it's own so you don't have to spend a lot of money on pieces accompanying the look. For example in the day and night look below the Decjuba singlet tops were AU $30 (or 2 for $45). 5. These pants are flare out and they're big and loose at the bottom so opt for a fitted top or tuck your top in to show your waistline. Loose and loose makes you look much bigger than you are. 6. These pants are a statement on their own so your top and your accessories should complement the pant and not fight with it. You don't need another statement piece however if you are really bold you could. For my day look I styled the pants with a white singlet top from Decjuba, flat printed shoes from Get me to New York, a hat from Sarah J Curtis, clutch bag from Rue 8isquit (a label I discovered in Italy last year) sunglasses from Saint Laurent, necklace from Alighieri from harrolds.com.au. For my evening look I dressed the pants up with heels I am wearing YSL Black Opyum pumps but you can wear almost any heel as the pant covers them. I changed the singlet to a black singlet (also from Decjuba), put my hair up, chose some large hooped earrings from F + H jewellery and my bag is from YSL. If you are a lawyer and you have to be in court, this look is not for you, however if you don’t work in a strict corporate environment and can have some fun with your work wear then this is a look you could try. 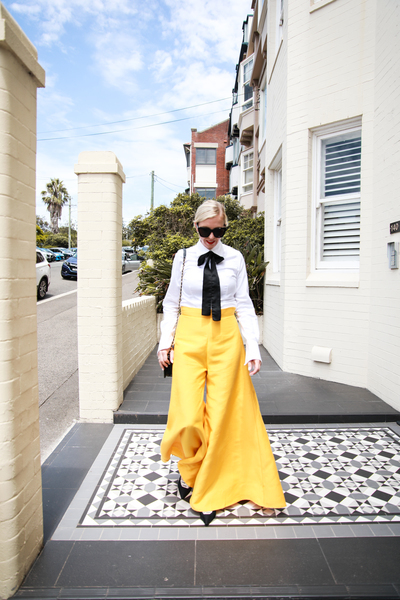 I have styled the pants with a white shirt (this is an old one from Herringbone but you could choose Anna Quan, White Story or even Saba for a shirt), a silk bow that I tied around my neck and under the collar, Dior heels and a Chanel bag. Always remember if fashion pain or dowdiness persists, please consult your Style Doctor. We can consult to anyone anywhere in the world via email and skype so you don't have to be based in Sydney.